The supply chain is a critical extension of the ASE business value chain. Active involvement in the development of our suppliers ensures that they share our goals of sustainability and also provide continuous quality and environmentally conscious products and services to ASE. ASE Group is the world’s largest provider of semiconductor assembly and test services and a major consolidator of systems and converging technologies. It is therefore our responsibility to have a positive influence on the global electronics supply chain. We regard our suppliers as long-term partners and propose to establish together a sustainable supply chain network. We also dedicate ourselves to responsible sourcing and developing technological capabilities in supply chain in order to provide responsible and first-class services continuously to our customers. 1. Taking proactive measures to ensure our purchasing practices are in compliance with the highest standards of professionalism and business ethics, abiding by all laws and regulations where we operate, and emphasizing fair competitions among suppliers and fair business between suppliers and ASE. 2. Fully implementing green procurement and conducting purchasing activities in accordance with ASE’s conflict minerals policy and green product regulations. 3. Building stable partnerships with suppliers, pursuing mutual benefits through full communications and collaborations while emphasizing risks and benefits sharing. 4. Requiring suppliers to abide by all applicable laws and regulations, adhere to high standards of business ethics, safeguard human rights, attach great importance to physical safety and mental health of employees, protect the environment and use their best efforts to fulfill corporate social responsibility. 5. 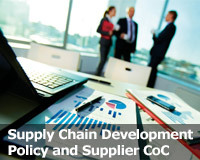 Being actively engaged in supplier management and coaching to assist suppliers with continuous improvement in competitiveness, undertaking supplier risk assessments which include delivery, quality, cost, service, technology and sustainability as criteria, and incorporating the assessment results into ASE’s purchase decisions. Any supplier still unable to meet ASE’s standards after receiving coaching will be replaced by an alternative supplier after full communication. 6. Integrating green product design into customers’ requirements as well as collaborating with customers and suppliers on developing innovative materials and equipment with an aim to advance technologies and enhance competitiveness in the whole supply chain network. We, Advanced Semiconductor Engineering, Inc., its subsidiaries and affiliates (collectively, "ASE"), being a responsible corporate citizen, have taken proactive measures to ensure the highest standards of professional and ethical business conducts. We believe that ASE’s long-term operation and success shall reply on the corporate sustainability and realization of corporate social responsibilities. Since the supply chain is a critical extension of ASE’s business value chain, we are actively devoted to developing supply chain to ensure that our suppliers, contractors, service providers and subcontractors (collectively, "Suppliers") collectively achieve the goal of sustainability. In order to ensure that working conditions in the supply chain are safe, that workers are treated with respect and dignity, and business operations are environmentally responsible and conducted ethically, ASE, by taking UN Guiding Principles on Business and Human Rights, Declaration of Fundamental Principles and Rights at Work and UN Universal Declaration of Human Rights as reference, enacts this Supplier Code of Conduct ("Code") which follows ASE Group Code of Business Conduct and Ethics as well as the Electronic Industry Citizenship Coalition Code of Conduct ("EICC"), and requires Suppliers’ business conducts with respect to labor, health and safety, environmental, business ethics and the management system to strictly comply with the Code as well as laws and regulations of countries/area where your operations exist. The Code consists of five sections. Sections A, B, and C outline tenets for Labor, Health and Safety, and the Environment, respectively; Section D sets forth tenets for business ethics; and Section E outlines the elements necessary to an appropriate management system to implement this Code. Our suppliers are our partners and we expect them to offer fair terms and safe working conditions and equal terms to their employees. We do not condone the use of child labor or forced labor and would remove any supplier guilty of such infringements. No suppliers' contracts were terminated due to use of child labor or forced labor in 2014. Communication with our suppliers is also key to our partnership, and in 2014, we recorded a total of 1,535 communication meetings with suppliers. In early 2015, we joined the Electronic Industry Citizenship Coalition (EICC), the world's largest industry coalition committed to creating shared value for the businesses, people, and communities that collectively contribute to the manufacture of electronic devices around the world. ASE has also adopted the EICC Code of Conduct to improve efficiency and social, ethical and environmental responsibility throughout its global supply chain, with the expectation that suppliers likewise act in accordance with the code too. In addition, ASE suppliers and partners are encouraged to commit to "The ASE Group sustainability supply chain management" policies and procedures when conducting business with ASE, as these have been developed to align closely with the EICC Code. We encourage our critical suppliers* to meet certified international standards such as ISO 14001, OHSAS 18001, and ISO 14064-1 for greenhouse gas verification and publish their sustainability reports. * The definition of critical supplier is the top 80% of direct materials manufacturers, based on transaction amount. We conduct a three-stage approach to promoting suppliers' sustainability performance: Assessment, Validation and Improvement. We request that our suppliers to sign the Assurance Letter of Compliance Conduct of Code to guarantee their compliance with human rights, working conditions, health and safety, environmental management, honesty, incorruptibility and non-disclosure of confidential information. New suppliers must pass our sustainability assessment, and critical suppliers must complete our sustainability questionnaire annually, which covers multi-aspects including environment, health and safety, energy management, risk management, human right and conflict minerals. We perform risk assessments for critical suppliers (on an annual basis) as well as new suppliers based upon the sustainbility assessment results. On-site or paper audits are carried out to ensure effective management of suppliers. We help our suppliers to improve their sustainability performance through meetings, trainings, questionnaire feedbacks, on-site auiting, QBR (Quarterly Business Review) and the annual best supplier awards. To ensure effective management of our suppliers' quality or sustainability performance, we had completed 28 pre-screening audits of new suppliers and 155 annual audits of critical suppliers. Based on those findings, we requested suppliers to respond with the improvement actions and re-audit their results of the corrective actions in the following year. Through these actions, our suppliers not only reduced their risks but are also able to maintain an effective management system. Environment Hazardous Substances No spill containment in chemical storage area. Require suppliers to propose improvement plans to avoid chemical spill. Air Emissions No air emissions management procedures. Require suppliers to set up air emissions management programs and procedures. Labor Working Hours Overtime working hours exceed requirements. 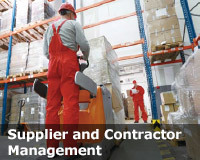 Require suppliers to set up working hours control procedure and management monitoring. Benefits Wages are deducted for disciplinary reasons. Require suppliers to avoid deduction of wages as a disciplinary measure. Human Rights Non- Discrimination Pregnancy testing is used as a condition of employment. Require suppliers to put anti-discrimination and anti-prejudice clauses in their recruitment documents. ASE and its contractors continue to work closely in a symbiotic relationship to achieve the 'zero disaster' target at the workplace. ASE also provides training and exercise to reduce safety and health risks and incidents, and contractors can enhance their performance by implementing safety and health management evaluations. In 2014, we recorded a total of 450 communication meetings with contractors for communicating our health and safety requirements and regulations. We also encourage our contractors to be certified for ISO 14001, OHSAS 18001 or other environmental, health and safety management systems and enhance their management approaches. · Security partnership: provide guidance to contractors and subcontractors to build a robust security management framework. · Conduct monthly assessment on performance to ensure "zero disasters" management. · Conduct regular communication meetings. · Health and safety training required for any personnel working on site. · Enhance the frequency of safety audits at work places. · Require contractors with high incidences of safety violations to make immediate improvements. · Identify high-risk work and establish corresponding safety precautions and control procedures. To ensure the safety of contractors, ASE enhances the safety and health evaluation for high-risk workplace. We conduct workplace inspection to ensure the health and safety performance of contractors. In 2014, we had completed a total of 362 workplace inspections. Environment Hazardous Substances Waste are not properly stored. Strengthen their management and inspection in waste storage area. Safety Occupational Safety Not enough personal protective equipment. Strengthen contractors' self- management. regarding machine safety. Strengthen contractors' training. 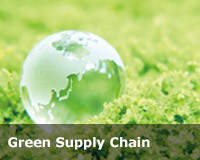 The development of the Green Supply Chain has been a major trend in global business activities. Over the past year, ASE management has relentlessly focused on corporate sustainability within its supply management. We are implementing a three-year (2015~2017) program to improve the sustainability performance of suppliers and create sustained value. The ASE supply management team has launched the ASE Guidelines for Supply Excellence: "SMILE to ART" ? Creation of a Framework that is Sustainable, Manageable, Innovative, Lean and Ethical, to build an Advanced, Resilient and Trusted supply chain network. There are three strategies to be implemented as follows: (1) Green Sourcing and Purchasing- Raw Materials, (2) Green Spending- Capital Expenditures and MROs*, (3) Green Logistics Services- Transportation and Warehousing. We aim to provide leadership and set standards for the backend semiconductor industry to engage in ethical business conduct, employee health and safety, environmental protection and management governance. Through collaboration with our tier 1 suppliers, we build up the management systems and operational mechanism which can be used as the reference model for all tiers of suppliers. * MRO: Maintenance, Repair and Operating. The mining and distribution of "conflict minerals"* originating from the Democratic Republic of the Congo (the "DRC") are sometimes controlled by violent organizations in order to fund conflict in that country and adjacent regions. 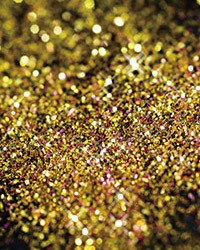 Our industry supply chains are inadvertently subject to metals derived from these conflict minerals which can be introduced through the metals we use such as gold, tin, tantalum and tungsten. ASE Group is dedicated to the elimination of these conflict minerals in our supply chain and to using only responsibly sourced conflict-free minerals**. It is also our objective to support the continued use of conflict-free minerals from the DRC and its adjacent regions such that responsible mining is not diminished. (a) Being diligent in their assessment and validation of their supply chains to ensure ASE Group’s objectives of a transparent supply chain and conflict-free purchases are inputs to the services and products we produce. (b) Be in compliance at all times with all regional and international regulations for conflict minerals. (c) Be in compliance at all times with industry standards for the sourcing and reporting of conflict minerals. (d) Being diligent and accurate in their formal assurances of conflict-free minerals provided to us. * Conflict minerals are columbite-tantalite (coltan), cassiterite, gold, and wolframite, or their derivatives as defined in the Dodd-Frank Act Section 1502 and SEC Rule 13p-1 under the Securities Exchange Act of 1934. ** Conflict-free minerals are conflict minerals that through their distribution directly or indirectly do not benefit violent organizations in the Democratic Republic of the Congo and its adjacent regions. To achieve ASE's goal that our suppliers are hereby encouraged and required to be diligent in their assessment and validation of their supply chains. 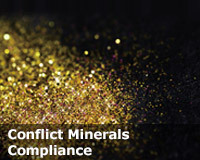 We request current Conflict Mineral Reporting Templates (CMRTs) from all suppliers of conflict minerals. Our suppliers have supplied the Conflict Minerals Reporting Template (CMRT) of their conflict mineral smelter and representation documentation to guarantee complying with the covenants of ASE's conflict minerals policy. Our conflict minerals due diligence measures have been designed to conform to the Organization for Economic Co-operation and Development (OECD) Due Diligence Guidance for Responsible Supply Chains of Minerals from Conflict-Affected and High-Risk Areas to identify and mitigate risk. On August 22, 2012, the U.S. Securities and Exchange Commission adopted final rules which relates to the public disclosure and reporting obligations by issuers concerning "conflict minerals" that originated in the Democratic Republic of Congo or an adjoining country. Since 2011, ASE has conducted an initial investigation and engaged our suppliers using the EICC-GeSI form to disclose information on smelters. In 2014, ASE has identified more than 330 suppliers who process 3TG* metals in our supply chain through the CMRTs they returned. On the basis of the due diligence measures in 2014, we had concluded that our substrate and wafer bumping products are DRC conflict free. We have obtained an Independent Third Party Audit (IPSA) to conform our DD procedure is consistent with OECD guidance and in compliance with requirements set forth in the SEC Conflict Minerals Final Rule and subsequent SEC Guidance. In early 2015, we joined the CFSI (Conflict-Free Sourcing Initiative), an initiative of the electronics industry organizations EICC and GeSI (Global e-Sustainability Initiative), which is the most utilized and respected resources for companies addressing conflict minerals issues.